yes linda you are right they all rot the same aluminum or stick built guess you never seen what's under a dolphin sidewall under skin at least the older ones they are a poor designed framing.as with a aluminum framed rv . very little wood to replace in the framing .other than the under sidewall skin witch is nothing to replace . rather than replacing a whole rotten sidewall framing and under skin that's the difference between the two. 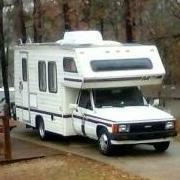 I have worked on thousands of class c and class A rv's .and been around a lot of toy homes.An from ground up restored my toy mini. Witch is a sun land express other than the sun raiders. a sun land express is one of the better built mini. even over a winno. For what I have seen of dolphins they are lacking in quality even in there class A rv's. dry rot and water rot is the killer of stick built rv's no matter how much you maintenance them . and i only paid $50 for it .with only 42000 on it. not to say anything bad about dolphins minis. i wouldn't buy one that old.just for the reason being they are all stick built and I'm sure there is a lot of rot in them.I have a 86 right now that looks darn good.you would never guess by looking at it that 75% is rotten. i just have it for parts if i need them. look around and try to find a aluminum framed mini. Sunland P Trap for Shower Source? Bypass considerations? jdfrost64 replied to TheGrayOutdoors's topic in Engines - Transmissions - Drive Train - Suspension - Chassis - Steering - Exhaust - Tires - Etc. I would get fuel tank to .and whatever you can also get out of it . coach looks clean under it. toyota new world, mini rv, rare Toyota New World RV - need any info available? but then again there's a lp line to going to the water heater.